According to the civil registry office (ZAGS), in 2018 in Tajikistan, the most popular names for the newborn girls and boys were mostly Arabic names. Last year, Idris, Imran, Muhammad, Abubakr, Abdullah, Omar and Yusuf became the most popular names for the boys. For the girls, the most popular names in that year were also Arabic and Hebrew: Maryam, Amina, Aisha, Assiya, Hanifa, Fatima and Habiba. The news agency Asia Plus reports about this in 12.01.2019. “If, until the 90s, Tajiks gave greater preference to Persian names, for example, from the book of the kings “Shaname” Firdousi – Siyavush, Sukhrob, Rustam, Faridun, Takhmina, Gurdofarid, and other names – Jamshed, Hurshed, Hushang, Kurush, Leila, Shirin, today they give preference to Arabic – Muslim names. This is due to the development of religious literacy”. It is obvious that the Islamic revival, which is taking place today in Tajikistan by the grace of Allah, is also manifested in what the people of this country call their children. However, it should separately be noted that, in general, both the Islamic revival and the return to Islamic names in particular occur despite the efforts of the tyrant-puppet Emomali Rahmon. After all, it is very important that in recent years Rakhmon has pursued a policy of brutal suppression of any manifestation of Islam in the life of the people. He imposed the fines for wearing the hijab and beard, forbade performing hajj until reaching 40, banned from receiving Islamic education abroad, closed all the madrasas in the country, closed thousands of mosques and prayer rooms. His faithful servants are constantly engaged in the persecution of the independent, and in the humiliation of the official religious figures. Now hundreds are in jails with long prison sentences, while others (official imams) are subjected to degrading procedures: they either make them go to the theater, or they are forced to sell tickets to concerts, and even one of the imams had to collect money to install a monument to Lenin (!). In addition, Rakhmon even tried to forbid people to give Islamic names to their children, trying to return them to the names of pre-Islamic times and Zoroastrian culture! 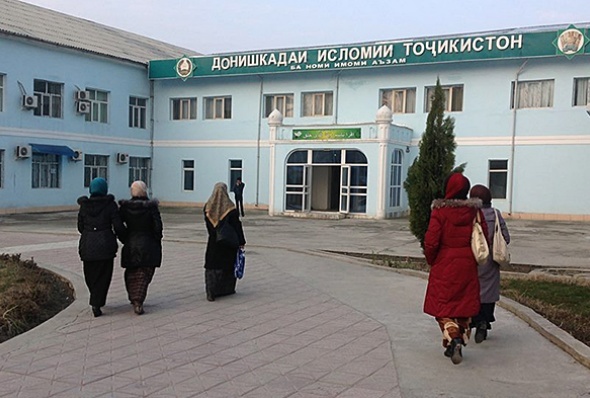 Thus, in 2016, many Tajik registry offices refused to issue birth certificates with the names Muhammad, Abu Bakr, Yasin and other Islamic names. Instead, they demanded that parents choose ones from the so-called “catalog of national names,” many of which were made up of the pre-Islamic names. However, because of the rising wave of indignation, the Tajik authorities did not succeed in legislating of this norm, and the trend towards the Islamization of the names continued regardless of Rakhmon’s desire. Thus, we see how, despite the increased pressure from the secularist regime of Rahmon, in Tajikistan there is a revival of Islamic consciousness, which manifests itself in all spheres of life. Next PostWill the Children of Al-Rukban Refugee Camp Be Allowed to Die of Cold and Hunger, yet Cannot find Anyone to Save Them? !